A few thoughts on the Liverpool 1 Arsenal 2 League match | "It's all about the Arsenal"
Back home 12 noon… Just watched the Sons team capitulate from being 3-2 up at HT to lose 7-3 at FT. Team is in……………. Szczesny, Sagna, Koscielny, Vermaelen, Gibbs, Arteta, Song, Walcott, Rosicky, Benayoun, van Persie. Subs: Fabianski, Diaby, Oxlade-Chamberlain, Jenkinson, Gervinho, Chamakh, Miquel. Stevie “Starfish” out for the bindippers. The fuss about RVP & TV5 being injured is shown to be nothing. 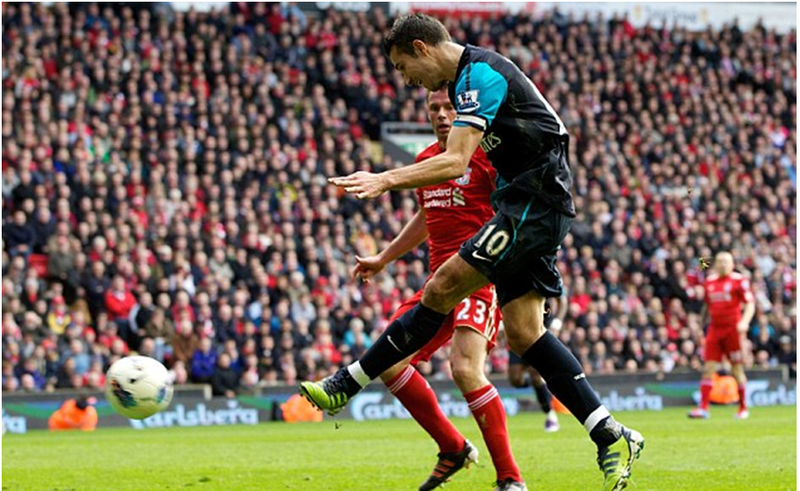 Couple of early corners for Liverpool, both cleared by Arsenal. 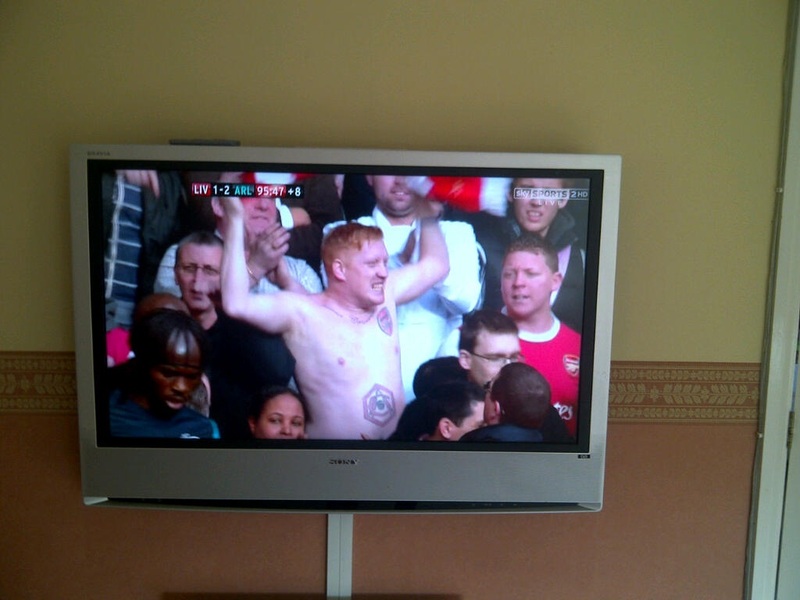 “Who’s that team they call the Arsenal, who’s that team we all adore……………………………….” Gooners in good voice. 10 Kos is a bit light-weight there and allows Suarez through, thankfully S13 heads the danger clear. this is quickly followed by Arsenal attack that ends with a wild shot by Sagna, which goes right across pitch. 13 Song dillies & dallies on the ball and is robbed. Liverpool attack and yet waste the chance, though Gibbs did well with good saving tackle. 15 A flick by Kuyt drops nicely for Downing and there is Bacara (yes Sir I can boogie) appears from nowhere and makes a superb tackle. It’s Liverpool’s game so far. Brilliant double save by S13 AMAZING!!!! FANTASTIC!!!! SUPERCALIFRAGALISTIC……………!!!! Justice is done as I thought it was a dive. 22 With Liverpool turning up the pressure, Spearmint passes to waste of money, who crosses and Koscielny hammers the ball past S13 to show Kuyt how to do it… 1-0 Liverpool. Nuuuuuuuuuuuuuuuts!!! 24 Liverpool are rampant and cut us to pieces again balls arrives to Henderson (20m?) shoots and another great save by S13, however, the ball runs to Suarez who hits loose ball against post Ooooooooooooooooooo that was close!!! Liverpool bossing this game. 27 Halsey give a pen for dive by Suarez that he clearly could not see for sure if it was and yet does not give obvious foul against Walcott. I really don’t get refs who cannot even show consistency in the same game, let alone a couple of mins apart. 30 BANG!!! Get in there!!! RVP scores from great cross by Sagna with a superb header that just flew past the hapless Riena. He scores when he wants! He scores when he wants! Robin van Persie, He scores when he wants! Couple of quick Liverpool corners that come to nothing as they try to get back in front. 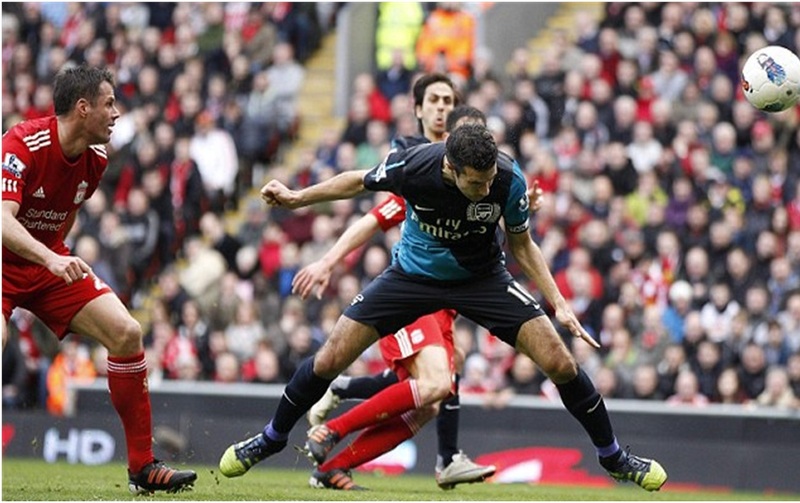 Well there’s a shocker Arsenal foul on Kuyt,free kick… Clever this ref. 39 Suarez weaves his way through four Arsenal defenders, shoots and there is S13 to tip round post.. that what a class save and keeps us in the game. HT1-1. Well not sure how we made it to half-time level at 1-1 but we did and I’m not going to knock it. In the half time Sky studio with Jamie Redknob and Alan Smith, incredibly (or maybe not) Jamie Redknob says the ref got the penalty right. On what planet, in what realm can Redknob say that was a penalty without resorting to total and utter bias on his part. Like last week with diver Bale, Suarez dived only 10 times this time worse than Bales. Shocking decision from Halsey. Sky you can show it 1000 times Sky and as close up as you like with super zoom in, yet you’ll never convince me that their shins touched each other. Never a penalty!!! Second half under way and Suarez already lively into shoots into side netting. 50 Henderson does Arteta. Arteta goes off on Stretcher. I think Henderson knew what he was doing. Maybe a bit more to that than meets the eye. I noticed that Sky did not show the replay save once. Maybe that tells us something. 56 Who’s this? Arsenal bringing on new signing, someone called Diaby. Hope he’s good? Diaby fella quickly gets into the game, does a soft shoe shuffle and shoots low, easy take for Reina though. “Oh to oh to be oh to be a Gooner” “Arsenal…. Arsenal… Arsenal…” Good to hear the Gooner section in good voice. Well done lads!!! 68 Liverpool corner is cleared. Short Skirt gets head on ball and it falls to Mother Kelly should have scored. Lucky let off. 71 and great ball from Song to Gibbs, who crosses and Theo shoots and Reina makes a good save. 72 Dirk Kuyt puts in a lovely cross that goes right across the Arsenal goal and Mother Kelly with open goal for a tap in and fluffs it. Lucky Arsenal… Good!! About time we had some luck. “Same old Arsenal always cheating comes the cry from the Kop. The irony? 73. Benayoun off to be replaced by Gervinho. Game looks to be heading for the usual draw at Anfield. 88 Waste of space goes off to be replaced by Bellamy. 2-1 to the Arse and me and the boy rise as one to great the ball hitting the back of the net… Get in there!!!! Now come on Arsenal, 6 mins to stay calm, play safe and hold on…. The Gooners in the crowd go mad. FT and it’s 2-1 to the Arsenal… Break and with shaking hands its cup of tea time… Back to the TV and Jamie Redknob and Alan Smith in the studio. Typical Sky TV talk rather than chat football, talk about RVP’s contract… Just give it a rest and enjoy what your being fed by one of the world’s top footballers. We can worry about contracts in May.. Passion, fight and commitment from the boys today – Proud of them… That win puts us 4 points behind Spuds and 10 ahead of the bindippers, who lose their first home league match of the season..
Have a great night Gooners… Spuds fans we’re coming after you. The 5:3 win against Spurs proved to be our greatest game this season. This 1:2 win against Liverpool will definitely prove to be our biggest 3 points.